The Steel Woods is the brainchild of singer/guitarist Wes Bayliss and guitarist Jason Cope and, for their sophomore release, the duo was able to bring more songs to the table and really nail down their sound. With bassist Johnny Stanton and drummer Jay Tooke in tow, the quartet recorded the album in a mere six-day break from a hectic touring schedule. The result is a quite superb record that takes ‘Straw in the Wind’ and elevates the Steel Woods sound to a new level. Opening proceedings with the rock-solid stomp of ‘All of these Years’ which features the first of many fine vocals from Wes Bayliss – who really could sing the phonebook and make it interesting – over a nice punchy riff and extended guitar break from Cope. ‘Without You’ is even better as a world-weary Bayliss proclaims that ‘You’d better get on with your life, before life gets on without you”. Next up is a Black Sabbath cover ‘Changes’ which to me initially seemed an odd choice but this soulful take tips a hat to the Charles Bradley version, while Stanton’s bass work is the backbone on which Bayliss and Cope are able to lay down a host of intricate guitar textures. The result is impressive and if you thought you’d heard enough versions of this Sabbath classic you’d be wrong. ‘Changes’ sets the scene for a quite stunning ‘Wherever You Are’ which finds the band at their most grandiose as Bayliss delivers a typically impressive vocal over sumptuous strings. ‘Blind Lover’ kicks things up a gear or three and allows Cope and Bayliss plenty of room to trade guitar lines before ‘Compared To A Soul’ adds guitar crunch and Cope more room for some impressive guitar playing. ‘Old News’ is epic in size and ambition with references to “Miss Liberty and the crack in her bell” it’s pretty obvious that Jason Cope, who wrote this one, is worried by the state of the country he calls home. ‘Old News’ is about people learning to get along and that has to be a good thing no matter where you call home. ‘Anna Lee’ picks up where ‘Della Jane’s Heart’ left us on the debut album with equally impressive picking and segues into the pounding instrumental hard rock of ‘Red River’. The guys get all funky as they slip in another cover with ‘The Catfish Song’ by Townes Van Zandt with Cope spitting out lead guitar lines as a harmonica wails. 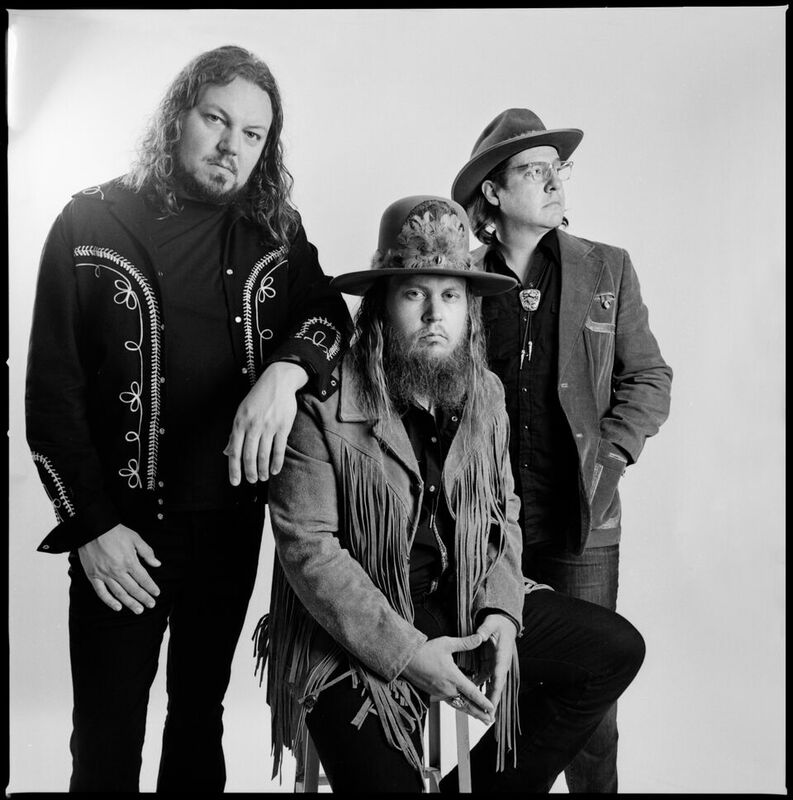 The album concludes with the epic ‘Rock That Says My Name’ which really is exactly what you’d want from a Southern rock band with a biblical verse from Wes’ grandfather just about the perfect way to pull the strands of the album together. If the album ended here you wouldn’t feel short-changed but The Steel Woods add four further songs as they pay tribute to departed artists that influenced the band. First up is one of a host of excellent songs penned by Alabama songwriter Wayne Mills ‘One of these Days’ which is beautifully performed here by The Steel Woods at their most country, before they repeat the trick and tackle a Merle Haggard classic ‘Are The Good Times Really Over (I Wish A Buck Was Still Silver)’ and the result is again fantastic. Gregg Allman’s ‘Whipping Post’ is stripped back to its core with some interesting breakdowns on the verses before Wes Bayliss adds a vocal to Tom Petty’s ‘Southern Accent’ that’ll be tough for anyone to beat. This final quartet of tribute songs proves to be a perfect way to end a stormin’ album. ‘Old News’ is a terrific record from a band that is going places. If you like your country to kick or just love the likes of Skynyrd, Hatchet, The Allman Brothers, Blackfoot and Doc Holliday then ‘Old News’ is for you. I've got a feeling that The Steel Woods will be making a few headlines of their own in 2019. Legendary Southern rockers Lynyrd Skynyrd are currently playing shows on their ‘Last of the Street Survivors-Farewell Tour’ with dates booked into late October of 2018. The band has toured heavily since their 1987 reformation, but with sole surviving founding member Gary Rossington enduring his own health problems in recent times maybe it really is the end of the road for Skynyrd but who’d bet against the band coming around again? Skynyrd released their last studio album ‘Last of a Dyin’ Breed’ back in 2012 and any further studio records look increasingly unlikely but the void has been filled to some degree by a slew of interesting live archival releases to keep hard-core fans busy which brings us to ‘Live In Atlantic City’ released on the German earMUSIC label. Toronto native Josh Taerk (pronounced Turk) is a new name to me but, with heavy-hitting support on his bio from E-Street Band drummer Max Weinberg and John Oates of Hall & Oates fame, my guess was his new ‘Stages’ EP would be well worth checking out. I’m pleased to report this assumption would prove to be correct as ‘Stages’ is a little gem. If ever an album lived up to its title it must be ‘Transatlanticana’ which finds the “Titan of the Telecaster” Bill Kirchen recording an album with the “Godfather of Pub Rock” Austin De Lone. Needless to say the results are pretty amazing and the UK release via The Last Music Company / Proper Records features two bonus tracks. Canadian vocalist Paul Laine has had a long and varied career as a solo artist and in the rock act Shugaazer, but is probably best known for his time as frontman for Danger Danger. Laine took over from original singer Ted Poley and spent a decade with the band. After a period working on other projects at his studio he returned to the limelight in 2014 as frontman for Darkhorse and released the excellent ‘Let It Ride’ album. Jamison Road is a trio featuring Jennifer DePalma (vocals), Brent Duersch (guitar) and Laurie Heltsley (bass / backing vocals) and ‘Let It Rain’ is their second album. It was released Aug, 2014 on the Sojourn label in the USA. The album was recorded in Nashville with Larry Beaird at the desk and with some of the top Nashville session players including Dan Dugmore and Eddie Buyers.